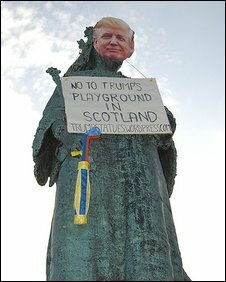 Campaigners against Donald Trump's £1bn golf resort plans in Aberdeenshire have dressed up statues around Scotland as the American tycoon. The Menie Liberation Front group said the masks and golf clubs had been added to about 20 statues in Aberdeen, Edinburgh, Glasgow and Stirling. The Trump Organisation condemned the "stunt". Grampian Police said the force was investigating the incidents in Aberdeen. Mr Trump hopes to build what he has described as the "world's greatest" golf resort at Menie. 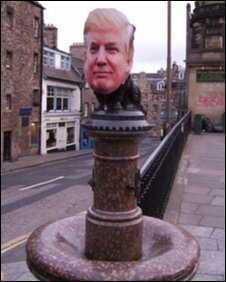 A spokesman for the protest group said: "We are dressing up famous Scottish statues as the American tycoon to symbolise the way Trump thinks he can walk over Scotland. "This development has gone too far. Throwing families from their homes for a private development is outrageous." The protest group - which has threatened further action - said no statues were damaged. Sarah Malone, executive vice president of Trump International Golf Links Scotland, said: "This publicity stunt is perpetrated by a handful of individuals, and can only serve to tarnish our regional and national profile. "Gimmicks such as this illustrate the lack of credibility of those involved and do a great disservice to local people. "We are dealing with serious issues that need to be handled in a responsible and mature manner." Grampian Police are looking for a man in his 30s and one in his 50s in connection with the incident. Officials from Aberdeen City Council have been removing the pictures, banners and sets of plastic golf clubs which were placed on the statues. Martin Glegg, of the Tripping Up Trump group, said he was not aware of the protest and had never heard of the Menie Liberation Front. He told BBC Scotland: "It shows lots of people are upset by the issue." The Trump Organisation has already won outline planning permission for two golf courses, a "residential village" and a hotel. Mr Trump has said his vision comprises a world class golf course, a second 18-hole course, 950 holiday homes and 500 houses. The proposal was originally rejected by a committee of the council before being called in by the Scottish government and approved. The Trump Organisation has said the owners of four homes on land which forms part of the planned resort have rejected "incredibly generous" offers. Mr Trump's son, Donald Trump Jnr, told BBC Scotland they had been offered a 15% premium on market value. He said they had also been given the chance to buy new homes at cost price, and the lifetime use of facilities.